Nissan has reintroduced the popular Sentra locally after an absence of about eight years. It is to compete in the C-segment where it will square off against the Hyundai Elantra, Chevrolet Cruze, Kia Cerato and Renault Fluence. The new Sentra follows hot on the heels of the recently introduced Almera, which is also positioned in a more affordable segment to rival the likes of the Hyundai Accent, Kia Rio and VW Polo. Design wise the Sentra features a prominent chrome grille, headlights with integrated LED daytime running lights and crescent-shaped brake lamp accents. A set of 16-inch alloy wheels rounds off the package. On the inside the cabin design is simple but features good fit and finish. Its biggest draw card is definitely ample interior space and boot space of 510 litres. Among the Sentra’s standard comfort and convenience features are remote central locking, a multifunction steering wheel with reach and rake adjustment, a radio/CD/MP3/USB/aux/iPod audio system, Bluetooth hands-free connectivity, air conditioning, and electric windows and mirrors. The Sentra’s safety features include six airbags, ABS with EBD and brake assist, Isofix child-seat anchorage points and doors that lock automatically on pull-away. Only two models, a manual or automatic, are available and both come with a 1,6-litre, naturally aspirated, four-cylinder petrol engine. This unit develops 85 kW and 154 Nm of torque. According to Nissan, the manual model returns an average fuel consumption of 6,6 litres/100 km and the CVT 6,2 litres/100 km. 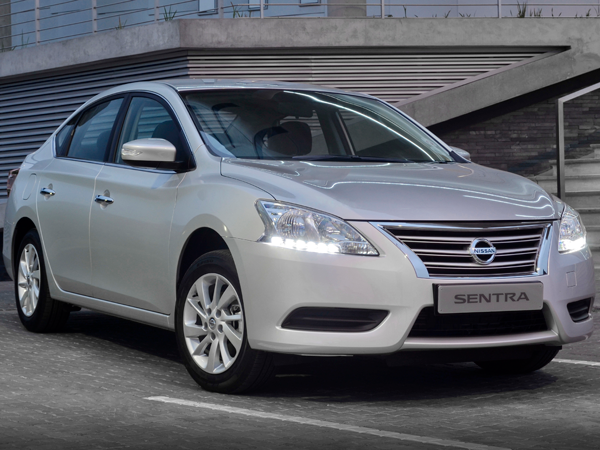 The Sentra range comes with a three-year/90 000-km service plan and a three-year/100 000-km warranty. Service intervals are every 15 000 km.